Bin There disposes of most non-hazardous materials such as construction, demolition or renovation debris, yard trimmings, green waste, household junk, appliances, furniture, scrap metal, dirt, sod, rocks, gravel, concrete, bricks, and any odds and ends. Click Here for a list of accepted materials. Can I Place Drywall In The Dumpster? No. Drywall CANNOT be mixed with any other debris as it requires special disposal and possible testing and as such requires a dedicated bin or special disposal arrangement. Click here for more information on drywall. Banned Materials CANNOT be accepted under any circumstance. The party and/or property owner contracting the bin is responsible and liable to ensure no banned or hazardous materials are present in the bin and are fully liable for any/all costs and surcharges related to the infraction including, but not limited to separation costs, reloading charges, penalties, bylaw infractions, HAZMAT costs etc. We needed to say that to make our lawyers happy. Click here for a list of Banned Materials. If you're still not sure give us a call, we are always happy to assist. What Is A Restricted Material? Restricted Materials are those which we can take however require special handling and as such surcharges apply. Click here for a list of materials. How Much Room Is Need To Place A Dumpster? In addition to the disposal bin & truck length, it takes more room to place a bin in the bins “roll-off” the rear of the truck. This requires an additional 30 feet to 50 feet to place or approximately 4 car lengths. Can The Bin Be Placed Where I Want It? Most of the time we can accommodate bin placement requests. Our drivers do have the final discretion on bin placement as safety and ensuring no property damage occurs is a priority for us. Factors such as the turning radius of the truck, length and height of the needed area to offload the bin do impact placement. Truck Rails need to rise about 20 feet so low hanging power lines, tree branches, car ports, or garages can also impede. Can The Bin Damage Property? Yes, it is possible. Placing a bin on a level hard surface significantly minimizes/negates potential damage. Disposal Bins have large rollers on the rear that allow them to roll off the truck onto the ground. Bins weigh 3 tons and the trucks much more. Bins can sink on lawns that appear dry. Asphalt driveways in the summer can have divots left in them from the weight of the bin. We can place wood down for the bin rails to sit on. Often this reduces the risk of damage to driveways. We kindly note we will not assume liability for damaged sidewalks, driveways and other property within and beyond the curb line (our lawyers made us say that). The material in the Bin must be loaded with even weight distribution and not exceed the Bin height. Bins, by law, must be tarped to safely transport them. Materials may be removed, or bin pickup refused if the load cannot be transported safely. In either case, a fee will apply to offload material or return for a pick up once the bin is loaded properly. No. For safety and insurance reasons as well as to negate potential damage to the bin or property only Bin There can move a Bin. For a reasonable fee, we will move the bin if it is required. Any damage that is not normal wear and tear will be the responsibility of the client. We include up to 7 days onsite with each bin delivery. Should you require the bin longer we also offer additional onsite time for an additional. We also offer complimentary additional onsite time for Multi Bin projects and Contractors. Please contact us for more information. Do I Call To Request A Bin Pickup? Yes, we kindly request a minimum of 24 to 48 hours notice in order to ensure your bin is removed in a timely manner. We only pick bins up once a customer contacts us for removal. Please give us a call at 604 980.7600 when you are finished with your bin. No Problem, give us a call at 604 980.7600 or order here. We are always available to help and to make it convenient for our customers. We often bring a fresh bin and pick up your full bin at the same time. Should I Be On Location For Delivery? If you have highly particular placement instructions or your delivery requires coordination with other trades you should be on location. If not, we are happy to deliver your bin at any time and forward by email a Service Agreement which outlines important disposal and rental information which we advise you to read. When booking your bin an EFT, Visa or Mastercard deposit is required to secure your order. The deposit will be processed on the day of delivery and a deposit receipt emailed to you. Bin There Disposal Services Ltd is an authorized VISA and MasterCard Merchant in good standing and protects customer information with confidentiality and integrity. Pre-approved accounts are offered for Contractors and other Commercial customers. Disposal Fees are based on weight and type of debris in the container. Once your bin is removed it is taken to a facility for recycling/disposal. 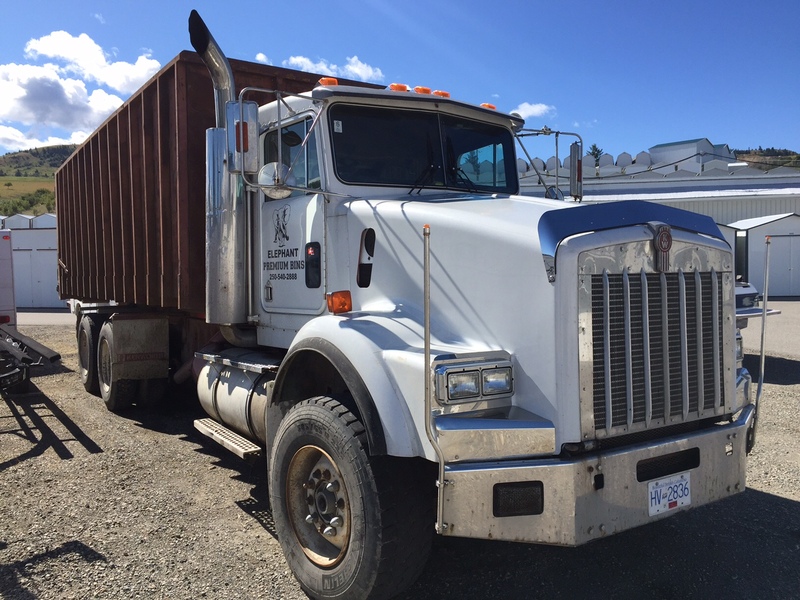 The facility determines the weight and grade (type of material disposed) which we detail on your Once your bin is disposed and final weights/materials are determined final invoice and email to you. Do I require A Municipal Permit For My Bin? If your bin is on private property a permit is not required. However, if you wish to have your bin placed on the street or alleyway, a permit is more than likely required. Give us a call and when we assist you in this process. It is your responsibility to ensure the proper permits are obtained and any bylaw infractions will be invoiced. Is Bin There Disposal Licensed and Insured? Bin There Disposal Services Ltd is an incorporated business registered in the Province of British Columbia. We have the necessary business licences and permits and are covered by WorkSafe, General Liability Insurance and the Insurance Corporation of British Columbia.